All Crane Training USA Inc (sister company to DBCE Inc.), endorses the National Certification Program offered by the National Commission for the certification of Crane Operators (NCCCO), and provides training to prepare candidates for NCCCO examinations. All Crane Training USA is dedicated to preparing candidates to successfully pass the designated tests to become certified by this national program. We offer written exams and practical exams on all categories of mobile, tower and overhead cranes. The International Assessment Institute (I.A.I.) administers the written certification exams for NCCCO. 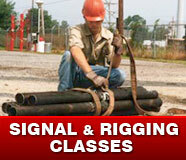 All Crane Training, USA is a test site for NCCCO written exams. We facilitate the I.A.I by providing a testing area for the I.A.I accredited examiner to administer the tests. The cost for the NCCCO exams can be found on the candidate applications for the specialty crane you are applying to for. For more information regarding candidate requirements, test dates and the application process for written exams click here. Practical Exams for Mobile, Tower, Overhead Crane operation and Signal & Rigging are conducted at our national training center in Oakland, California. All our examiners are NCCCO accredited. Practical exams can be scheduled at anytime the operator feels comfortable with being tested. Practical exams are just that, EXAMS, no training will be provided during this exam process. Examiners are only observers, noting the time and incidents during the exam. For more information regarding the testing process and fees for practical exams click here. Our experienced staff has processed and tested thousands of candidates. For additional information please contact us during our regular business hours Monday – Friday 7:00 am to 4:00 pm.